The sense of over-familiarity doesn't improve when the game tries to introduce the new core mechanics either, all of which prove to be as tired and predictable as the franchise as a whole has obviously become. So, yes, there's bullet-time which you get fairly early in the game via an enchanted medallion. The game calls it the 'Mire' ability, but it's essentially bullet-time and it's not even presented all that enjoyably. To be totally fair to Wolfenstein though, there are a few more special powers you get throughout the game, not all of which are as worn-out as the ubiquitous slow-mo ability. 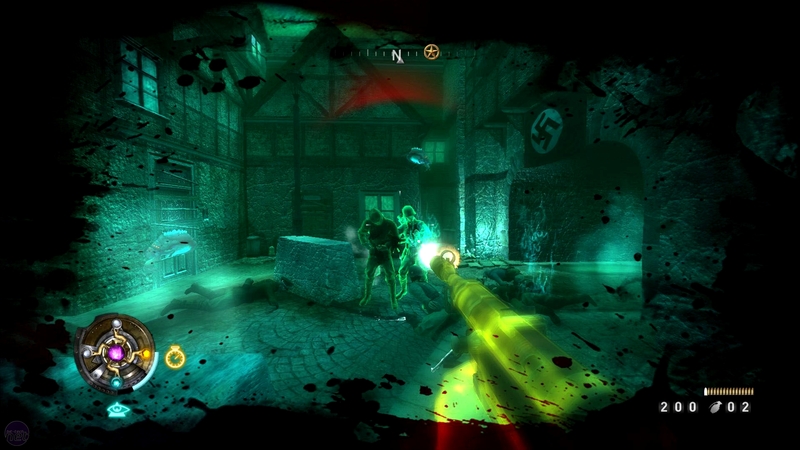 You quickly acquire a Shield ability too, though the most interesting power of the Thule Medallion is the basic Veil mode, which overlays the screen with an ectoplasm green filter and highlights enemies. It's main use is for seeing in the dark, but it also makes enemy weakspots glow bright red too and that makes new enemies pretty easy to figure out – which is both good and bad. Less challenge, less frustration. Still, no matter what your opinion on being told outright where to shoot, you have to admit that it was very considerate of the ancient wizards to enchant their medallion with the ability to make Germans glow in the dark and highlight the weakpoints of a particle cannon trooper. The slow-mo and special powers provided by your enchanted medallion aren't the only new features in Wolfenstein though. Raven has tried to bring the classical and the contemporary together even more by infusing Wolfenstein with options for upgrading your weapons, collectible items and even a semi-open world kind of feel that breaks the town of Lsenstadt down into several districts. Open-world is a bit of a misnomer though, as hardly any of these areas are actually open to you for exploration at any given point and the game is still very linear and mission-based, with regular loading screens between each different part of the city. It isn't GTA and you can't decide to suddenly enter a building and search it for supplies. All it really means is that in between the actual missions you'll be running back through the same old streets to get some new information from one of the game's factions. Again, a bit of a mislabelling perhaps. 'Faction' suggests being able to ally yourself with different groups and direct the plot as you wish, but that's not the case. Wolfenstein is no more Deus Ex than it is GTA. In Wolfenstein it's purely that there are different groups of NPCs that you can find in the inter-mission city streets, some of whom can give you information and objectives and the like. 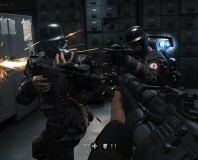 The main factions are the Nazi Resistance you fight alongside and a mystic group called The Golden Dawn, but the one which offers the biggest change to Wolfenstein as a whole is the Black Market, whom you can visit for supplies. By completing missions you unlock new weapon upgrades, like scopes for your rifles and expanded magazines for your machine guns, which you can trade for the Nazi gold you pick up around the levels. You can also buy new magic crystals, which are apparently available in every store, luckily. The deeper ethics of pilfering Nazi loot are perhaps a bit worrying, but we won't dwell on it. 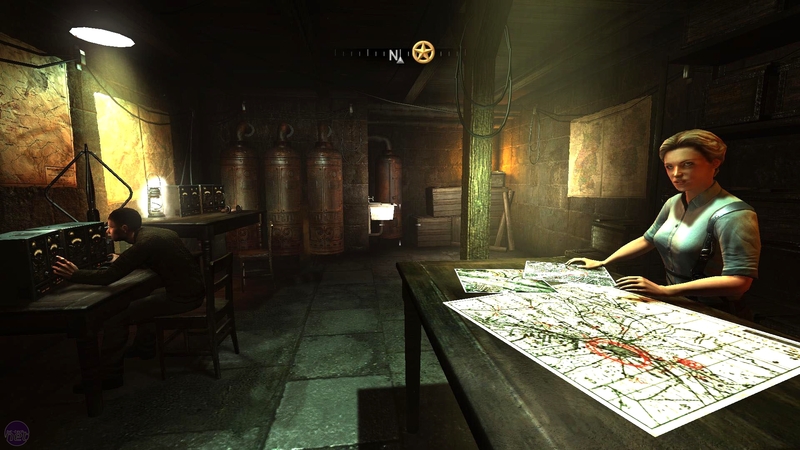 Instead, we'll look at the more interesting of the collectible items in Wolfenstein – items of intelligence that can be spotted around the levels. Fairly easily spotted in fact, since everything you can interact with in the game glistens with a gossamer shine that's about as subtle as a ferret in your trousers. Intelligence is hidden in different places and sometimes requires you to hold down the Use key to search bookcases, but it's mainly just lying around on desktops. Either way, once you find it you can then read over it in detail to get more information on the plot, as well as tips, which makes it one of the few areas of the game that doesn't something (relatively) uncommon and worth paying attention to.